Anybody in the mobile business can attest how expensive and how difficult it is to create differentiation around a mobile brand and offer. Speed, price and coverage tend to be the concrete tactical sources of differentiation. Creating value through branding always is more tricky, but Sprint might try something that is interesting, for the small business customer segment. Apparently, Sprint is considering relaunching Nextel as a small business brand, with one interesting twist. The proposed Nextel offer would combine both fixed broadband access and mobile service, a byproduct of Sprint's ownership of the former "Clear" fixed wireless network. In essence, Sprint would create a fixed network plus mobile service bundle. Some might say that only matches what AT&T or Verizon might be able to offer, but perhaps that is the point. In at least some markets, Sprint might be able to compete more effectively in the small business segment with a fixed broadband plus mobile offer, partly offsetting the speed, price and coverage comparisons every potential customer knows are among the potential differences between suppliers. How Much has the Internet Harmed the Telecom Business? Has the Internet harmed the telecom business as much as it apparently has reshaped many other retail and consumer businesses? You might think the answer is fairly simple. It would, after all, be possible to argue that the Internet has affected virtually every business in a way that reduces friction (and hence distribution cost), provides price transparency (driving prices towards the lowest cost producers) and creates new alternatives to existing services and apps that reduce demand for the legacy apps. To use the most obvious example, over the top mobile messaging and over the top voice apps have displaced some amount of calling and text messaging, while arguably having the more important impact of reducing or capping prices for legacy services. Of course, matters are more complicated. The Internet also creates the need for fixed and mobile network data services, which add revenue. So any assessment would have to include actual lost revenue from reduced legacy services, abandonment of services, the effect of stranded investments in legacy infrastructure, higher investment in IP infrastructure and then incremental new revenue based on Internet access. Even the apparently clearest signs of cannibalization--abandonment of fixed voice lines--are not necessarily the result of Internet substitution, but rather preference for mobile calling. And though it also is possible that some amount of mobile carrier voice will be displaced by Internet calling, the magnitude of the eventual shift is not clear. And some might argue that even when over the top calling services displace some carrier voice revenue, there are other forms of value that actually increase revenue for service providers. Based on interviews with executives from 3 in the UK and customer analytics data from 3 and Skype, CCS Insight concluded that use of Skype provided unexpected benefits for mobile service provider 3 in the United Kingdom. “While 3 initially aimed to use Skype as a means of differentiation and as an acquisition tool, one of the most significant impacts was to drive up margins, especially through an increase in voice revenue, but also by reducing churn,” CCS Insight argues. almost a third more on text messaging than non-users of Skype. Skype users provided margin uplift of more than 20 percent and regular Skype users churned 14 percent less churn than non-users, CCS Insight argued. To be sure, it also is possible that heavy or regular users of Skype also use more communication services in general, so whether there is causation or only correlation is tough to say. For example, in the U.S. market, though telco revenue from fixed voice lines is down, broadband and video entertainment revenues are up. For U.S. cable providers, the loss of video customers has been compensated with growth in Internet access and voice services. For Verizon, whose third quarter 2013 mass markets revenue was up slightly over the third quarter of 2012, the obvious implication is that video and broadband are driving revenue growth at rates that compensate for losses of traditional voice accounts. Likewise, AT&T reported third quarter 2013 fixed network consumer revenue growth of 2.4 percent versus the year-earlier period. Those performances occur against a backdrop of declining demand for fixed voice lines. Perhaps 39 percent of U.S. households no longer buy fixed voice service, according to the Centers for Disease Control. The point is that the Internet has had a complex impact on telecommunications revenue. On one hand, it has put pressure on profit margins for legacy voice. At the same time, it has created a brand new market for Internet access in the fixed line business. In the mobile services business, a similar trend is occurring. Revenue growth in saturated mobile markets now is lead by Internet access revenues. In other words, the Internet arguably has had both positive and negative revenue implications for service providers. 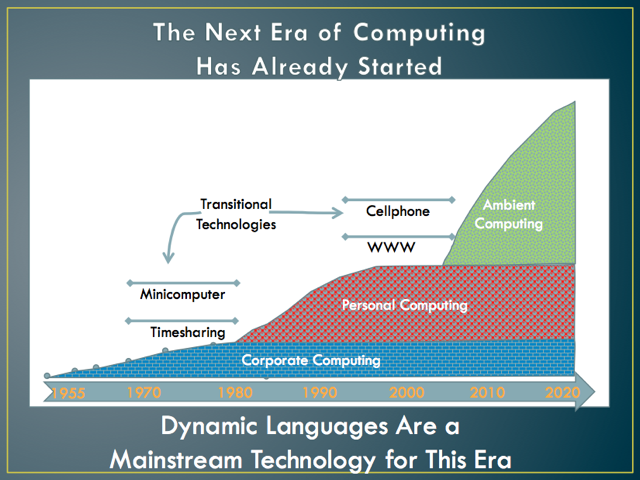 If in fact we are moving towards the next era of computing after the “PC era,” it should not come as a surprise that the types of computing devices also are changing. Tablets, which derive much of their value from cloud apps, content and storage, provide one example. But the best example is a Chromebook, a device that relies nearly exclusively on cloud-based computing to provide value. To a growing extent, smartphones provide value by use of cloud-based content and apps as well. Virtually everyone might agree that something important in computing architecture is happening, namely the transition from an older ear to a newer era. Some of us prefer to call the earlier eras of computing “mainframe, minicomputer, PC,” followed by the current era, which seems not to have a universal appellation. Others might say the eras are “mainframe, personal computer, web era, device era.” Some might specify the eras as corporate, personal, ambient. Yet others might differentiate computing eras by computing architecture. IBM has spoken of “mainframe, departmental, PC, Internet and Social as earmarks of how enterprises use computing. The point is that the signature devices in each era are different. Mainframes and minicomputers were used by only a few enterprises. PCs were adopted by consumers. Then came the Internet, and phones became computers. Recently tablets have gotten traction. So we should not be surprised that devices optimized for the coming era of computing are grabbing more share of computer sales. The issue is pinning down precisely the main characteristic of the next era of computing, which might be said to include attributes such as ambient usage, based on highly personal devices and relying on cloud resources to provide computing utility. That would include tablets, smartphones and Chromebooks, to various degrees. Phones are most uniquely personal and ambient, while tablets and especially Chromebooks rely on cloud computing for core functionality. So whether we emphasize “mobile or ambient,” types of devices or architectures, the elements of ambient and cloud-based would seem central to any description of the coming era. So sales of cloud-based appliances should grow smartly. NPD Group reports that Chromebooks to commercial customers (not consumers) accounted for 21 percent of all notebook sales, for example, up from negligible share in the prior year, and eight percent of all computer and tablet sales through November 2013. Chromebooks represented just one tenth of a percent of notebook sales in 2012. By definition, a Chromebook uses a cloud-based computing architecture to provide value. Tablet sales likewise are an instance of reliance on cloud computing. Tablets represented more than 22 percent of all personal computing device sales sold through the commercial channel through November 2013. For some of us, the important observation about business customer device sales is the uptick in devices that rely centrally on cloud computing for value. Of the "10 things not to buy in 2014" cited by MarketWatch, cable TV is number one on the list. Ouch. Landline phone service is number two on the list. Ouch, ouch. Two-year mobile phone contracts are number six on the list. We sometimes forget how much legal wrangling has occurred as the home video market was born. Sony released the Betamax digital video recorder in 1975. But not until 1984 was its use deemed fully lawful. Only because of that important decision was it possible to later see the rise of Blockbuster Video and Netflix. It might seem odd, but it once was illegal to “own a copy of a movie.” So the notion of an “at home video market” was nonsensical. All media was consumed either outside the home or using devices that could receive but not store content. Some level of conflict between proponents of technology and owners of content has been a rather common feature of the content business, though. Cable TV operators were at times denied the riight to import a distant TV signal and show those signals to local customers who could not otherwise get over the air TV service. Later, the content industry tried to outlaw the rental of videos, music and software. The industry also tried to ban other new technologies, such as the digital audio-tape player, a successor to the analog audio tape player, and otherwise tax and slow the use of blank tapes, conpact discs and CD recorders, music players and digital video recorders. Sometimes the opposition comes from other sources, though. For some, it might seem obvious that users ought to be able to obtain quality assured Internet apps from a caching site to their homes, as app providers now purchase the same quality assurance features from content delivery networks, or which business customers can buy. For others the best effort Internet is better since it offers a level playing field, in terms of quality access (the biggest and the smallest app providers face the same challenges delivering quality experiences). Beyond those differences of views, revenue models are at stake. Struggling to avoid commodity status for their product, ISPs hope to use quality of experience as content owners use image quality (standard definition, high definition, 3D) as ways of differentiating experience. The helpful byproduct, from an ISP perspective, is the chance to create a new revenue stream or two, in the form of CDN services available to the end user, not simply to a data center. The other potential revenue stream is some optional ability for end users to set their own preferences for delivery of apps, when networks are congested. In essence, some believe the Internet access service should be “dumb” (best effort only) while others think Internet access service should be “smart” (able to prioritize packets). Telcos have done so routinely, actually blocking end user access when the voice network is overloaded (“I’m sorry, all circuits are busy right now. Please try your call again later.”) So “admission control,” a standard practice in the voice business, has an analogy in the Internet access business. Some essentially could argue that prioritized packet access somehow defeats the “any to any” nature of the Internet. One hears that argument less these days as the old “any to any” Internet has been abandoned or transformed in many ways. Some country regulators do actually block apps. And many private apps essentially “block” access to rivals by design. In other words, the Internet might permit anybody to communicate with anybody else. But that doesn’t mean any particular app has to do so. It might be a bit of an existential argument, but some policies sometimes are necessary or desirable in part because they allow Internet access to exist and flourish. That is the argument made by ISPs who must keep investing in better and faster networks. People can argue about the amount of market power held by app providers, device makers or ISPs. People can argue about the retail prices or profit margins enjoyed by any of the contestants. Still, it is a legitimate matter to design and support a viable commercial ecosystem that allows the whole ecosystem to flourish, and differentiated services, features and prices might be a necessary part of that effort. In other words, in order to provide first access, then quality access, to everyone, requires sustainable revenue models. A good part of the debate about quality of service mechanisms revolves around the effort to create such sustainable models. It isn’t the only relevant issue, but it is a legitimate issue. Which Revenue Opportunity is Bigger for Mobile Service Providers: Entertainment Video or OTT Messaging? Will over the top messaging, or video entertainment, will be a more important revenue source for mobile service providers? And, to the extent revenue is earned, will it be a direct or indirect contributor? Your answer likely would be different, based on which market is considered. Countries at immediate risk include the Netherlands, South Korea, Japan, Spain, Germany, Switzerland, the United Kingdom, Singapore, and Russia. At moderate risk are Canada, the United States, Italy, Poland, Australia, Austria, France, and Hungary, according to analysts at McKinsey. At low risk are most countries, where voice and text messaging remain staples, and where mobile data access adoption remains low, at least for the moment. Conversely, markets where consumers have eagerly embraced social messaging, where smartphone adoption is high or text messaging tariffs are moderately high are most exposed. Informa Telecoms & Media has predicted that mobile operators will generate a total of $722.7 billion in revenues from text messaging revenues between 2011 and 2016. Third-party providers of over the top (OTT) messaging services will earn about $8.7 billion in 2016. That disparity in revenue illustrates the issue. Mobile service providers will lose about two orders of magnitude more revenue than all OTT apps earn. So even if telcos become significant providers of OTT messaging, and it is not clear that can be done to any significant degree, you might ask whether the effort is better placed elsewhere. Put another way, if the potential market is 50 cents a month in revenue, while the lost text messaging revenue represents $10 a month, it isn’t immediately clear whether the effort is justified. Some will argue that new forms of bundled products (carrier OTT plus other carrier products) will prove viable. That assumes the carrier OTT product has enough intrinsic value to warrant buying it. A carrier can, of course, simply structure tariffs in a way that makes carrier voice, text messaging and carrier OTT messaging a single retail offer. Even then, one might argue the effort (time, people and capital) might offer more substantial revenue impact if deployed in other areas. Still, some might argue the upside is in “higher perceived value” for the carrier communications package, not direct revenue. That’s a valid strategy, so long as carrier OTT messaging actually gets any sizable traction with customers. At least for the moment, indirect revenue sources seem the most likely outcome, and perhaps most significant for video entertainment, rather than messaging, even if that appears to be off in the future. Consider that telcos today earn far more revenue from video entertainment than VoIP. In fact, any gains in telco VoIP are more than matched by losses in the traditional voice business. In fact, over the top messaging and voice alternatives almost certainly will be the main trend, not the earning of incremental revenues from carrier VoIP or over the top messaging. The magnitude of losses from legacy products will simply be too massive, in some markets, with losses possibly ranging from 20 percent to 30 percent over several years, in both voice and text messaging services. It is very hard to see how carrier over the top messaging compensates for losses on that scale. People will buy mobile Internet access so they can use the over the top messaging apps, as well as buying larger buckets of usage to watch mobile video. In both cases, the primary revenue upside is indirect, coming in the form of higher end user spending on access packages. Perhaps the bigger question is whether video entertainment--provided as a service or through a gateway app--could emerge as a significant direct revenue generator, and not simply an application that drives demand for Internet bandwidth. Much depends on the answer. Though helpful for mobile service providers, direct video entertainment services, modeled on the subscription video model, such a development could have major ramifications for existing providers of such services, including cable TV, satellite TV and telco TV providers, shifting demand in possibly significant ways. Does mobile-delivered video entertainment seem likely to replicate traditional linear TV? Most probably would agree that is rather unlikely, simply because point-to-multipoint networks are efficient ways to deliver linear content, while point-to-point communications networks, especially mobile networks, are not efficient. But future video entertainment might include at least some forms that are passably well suited for delivery even over point-to-point networks. Obviously, recent end user behavior with respect to consumption of YouTube, Netflix streaming and other forms of non-linear video consumption provide a reason for suggesting that sort of behavior could underpin a newer form of video service not dependent on linear delivery (not pushed or broadcast but pulled by viewers). So it is at least possible that some demand for traditional TV subscriptions could shift to mobile delivery, as a byproduct of a switch to greater reliance on "pull" or content on demand modes. It wouldn't be easy, but video entertainment remains one of the more reliable applications a service provider can sell. The number of users globally paying for mobile video and TV services is expected to jump to 534 million by 2014, a five-fold increase from 2008, says Pyramid Research. Derek Medlin, senior analyst at Pyramid Research, says "this is equivalent to 8.5 percent of all mobile subscriptions, up from the current 2.5 percent level." "Looking ahead, Asia/Pacific will remain in the top spot, attaining more than 281 million subscriptions by 2014, although we expect Latin America to grow at the fastest pace, increasing at a CAGR of 39 percent from 2009 to 2014," Medlin says. Until now, mobile operators haven’t done much to promote mobile video. In fact, under challenged bandwidth circumstances, it sometimes makes sense to actively discourage such consumption. But Long Term Evolution helps. And broadcast forms of LTE will help more, at least for linear content delivery. The challenges of delivering mobile content are balanced by the size of the revenue opportunity, though. Worldwide video service revenue (cable TV, satellite TV and telco TV) grew in the first half of 2013 to $110 billion, up two percent over the second half of 2012, despite weakness in the U.S. market, where video subscribers are declining at a pace of 1.5 percent to 2.5 percent annually. You can make your own determinations about whether that trend indicates non-interest in the product, or simply non-interest in the way retail offers are constructed. By 2017, Infonetics expects the global video subscription services TV market to hit $270 billion in revenue, a 2012–2017 compound annual growth rate of nearly five percent. The issue is how service providers can earn revenue from mobile video, which today is largely a potential revenue stream for application providers. Although only a third of Verizon subscribers are on LTE, those users consume 64 percent of its data, with a “surprising” amount of that being video content, according to Verizon. And that's why entertainment video might someday generate far more revenue for mobile service providers than over the top messaging. Perhaps for every problem there actually is a solution, though perhaps sometimes the answer is not what we might prefer, expect or want. Back around 1995, I ran into one of those problems. The context was voice pricing trends. To make a long story short, the problem was a confluence of trends that all seemed to suggest voice revenues were headed south. The process of deregulation and privatization of former monopoly networks was one such early trend. But in addition to competition, technology trends all suggested prices would drop. Among those trends: optical fiber, microwave transmission, Internet Protocol, client-server architectures, Moore’s Law and declining microprocessor and storage costs. I cannot recall whether I believed at the time that mobile communications would put pressure on voice pricing as well. But in 1993 the United States had not yet passed the Telecommunications Act of 1996, which would for the first time allow multiple competitors into the fixed network local telecommunications business for the first time. The concept would reappear about 1999 and 2000, when the phrase “bandwidth wants to be free” was bandied about. Perhaps that was not the first illustration of a business strategy based on Moore’s Law. Perhaps one might say that Microsoft, for example, built its software business around an understanding of Moore’s Law. One might argue lots of firms have implicitly or explicitly made continuing declines in the cost of computing and storage part of their business strategy as well. “Moore’s Law was baked deeply into the founding strategy of Electronic Arts,” says Bing Gordon. The whole point is that technology makes “near zero pricing” in any number of contexts a foundation for business strategy. The key point is not that prices actually hit zero, only that they drop so precipitously that access to computing and memory no longer are constraints to what can be done. But that’s a problem for incumbent providers who have built substantial businesses on scarcity, either scarcity of bandwidth, processing or memory. And that was the conundrum when asking what impact near zero pricing would have for telcos. At the time, I could think of no reasonable answer. If the revenue source telcos depended on shrank so much, what would become of them? Remember 1993. The web browser had just been invented. There were very few Internet hosts, not to mention few users. Voice services represented nearly all revenue for a telco. The point is that, at the time, the notion that Internet access, not to mention “broadband” access would become a significant revenue generator for fixed network service providers was simply not conceivable. In fact, even dial-up Internet access was at such a low level it was not tracked by some firms at the time, such as the Organization for Economic Cooperation and Development. Fixed network service providers continue to face challenges, to be sure. But the answer to the problem of near zero pricing for voice has been answered, at least for the moment. New revenues from Internet access and video entertainment, not to mention diversification into mobile services, have staved off declining voice revenues. I couldn’t see that at the time. So near zero pricing for voice has not been catastrophic. It is a problem, but not an unsolvable problem, as difficult as it was in 1993 to foresee the future. And that's the problem with predictions: we tend to be bound by an inability to see futures that are shaped by other unknown or unrecognized trends and developments. What's Upside for AT&T Gigabit Networks? The Year Broadband Access Prices Were "Destroyed"
Can "Internet Access" Be More Than a Commodity? Is U.S. Mobile Market About to be Rearranged? Is A La Carte TV a "Farce?" Motorola Modular Phone Prototype "Almost Ready"
Does the Telecom Industry have a Life Cycle? Chinese iPhone Buyers are Not "Average"
Half of all Smart Phones Bendable by 2019?